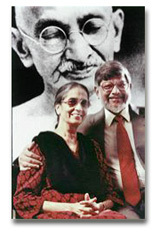 Manilal Mohandas Gandhi (28 October 1892 – 4 April 1956) was the second of four sons of Mohandas Karamchand Gandhi and Kasturba Gandhi. Manilal was born in Rajkot, India. In 1897 Manilal traveled to South Africa for the first time, where he spent time working at the Phoenix Ashram near Durban. After a brief visit to India, in 1917 Manilal returned to South Africa to assist in printing the Indian Opinion a Gujarati-English weekly publication, at Phoenix, Durban. By 1918, Manilal was doing most of the work for the press and took over in 1920 as editor. Like his father, Manilal was also sent to jail several times by the British colonial government after protesting against unjust laws. He remained editor until 1956, the year of his death.